Watch the British TV show 'Spy' on Hulu. Hey, people with kids: I loved reading through this recent post about ten great children's books destined to become classics on the TED blog. I've already ordered a copy of Hip and Hop, Don't Stop! — the tale of the friendship between Hip, a turtle who raps really slowly, and Hop, a rabbit who raps super-fast — and am beyond psyched to read it to all the lil' ones in my life. — L.T. Hip and Hop, Don’t Stop! 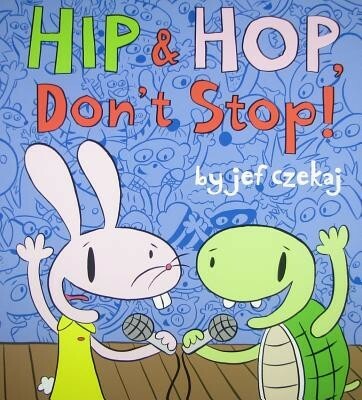 'Hip and Hop, Don’t Stop!,' a children's book destined to become classic. Apropos of absolutely nothing, for some reason I reread The White Album over the weekend and it is exactly as good as it was when I was a wide-eyed college freshman. — E.C. I'm not a parent, but that doesn't stop me from enjoying a little bit of baby-themed humor every now and then. Michael Fertik is a Palo Alto techie and dad who fell so hard for his baby boy that he had to write about it — in a very grown-up, illustrated chapter book. Little Trouble in Tall Tree imagines the inner lives of the babies of the Poopypants Gang as they plot a massive heist to secure all the area's fresh breast milk. Okay, it sounds a little gross when you put it that plainly, but the descriptions and pictures are hilarious, and you can read the whole thing in about a half-hour, laughing all the way. And you can also tell your friends you're into the new genre — baby noir. Read more about Fertik via his article in the Palo Alto Patch, and you can get the book, or an adorable onsie, on his website. — A.P. Whitney’s basically already said it all, but you will definitely see me on the dance floor at the New Parish for Shabazz Palaces on Tuesday. — E.C. Music nerds, whether they're a fan of this band of not, will delight in Color Me Obsessed: A Film About The Replacements. It's two hours of fans — many of them famous in their own right — foaming at the mouth about what made The Replacements so special. The low-budget documentary couldn't get the rights to use the band's music or archival footage, but that ends up being part of its magic. After watching it, all I wanted to do was listen to this band. — W.P.